Located on the western slope of Mt. Washington, the Cog Railway Ski Trains operated for two seasons. Developed by Sylvester Marsh, the Cog Railway carried its first passengers some 3,500 vertical feet up Mt. Washington on July 3, 1869. Apart from periods of war, the railway has remained in operation ever since. In 1983, Ellen Teague sold the Cog Railway to the Bedor and Presby families, whose investments in infrastructure and marketing doubled ridership in just a few years time. Wayne Presby later commented, "I've been thinking about skiing from the Cog since we purchased the railway." 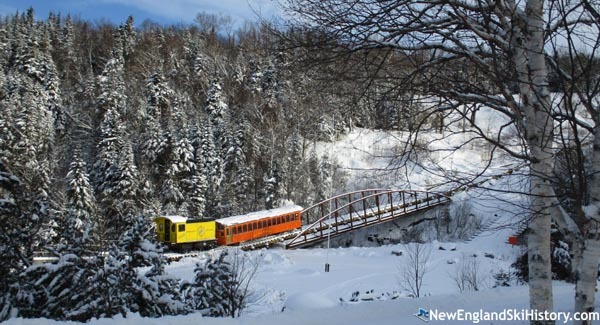 In early 1987, the Cog Railway proposed operating a ski train to the summit during the months of April and May, providing easier access to the snowfields and Tuckerman Ravine. As Presby told Ski magazine at the time, "the train has, for decades, taken people up with their skis, it was just never promoted before." The Appalachian Mountain Club, despite recently publishing a handbook that suggested skiers could take the cog, strongly opposed the ski train proposal. The United States Forest Service also opposed the service and even deployed rangers to the summit in the spring of 1988, informing cog skiers that they could either turn back or be arrested. As Presby told Snow Country, "Ironic. The Forest Service says we can ride to the top on the train. And says it's okay to ski down the mountain. But it says, 'Don't do both on the same day.'" Bedor and Presby's MWH Preservation Limited Partnership acquired the Mount Washington Hotel at auction in 1991, followed by Bretton Woods in 1997. With infrastructure and amenities constantly being improved, a new possibility emerged for skiing off the Cog Railway without being blocked by the Forest Service: skiing the company's privately owned land on either side of the tracks. Mount Washington Cog Railway Ski Trains officially opened for the 2004-05 season, initially with the novice slope on December 18 and the full slope on December 26. A heated train could transport 70 skiers up 1,100 vertical feet to 3,800 feet in elevation in 15 minutes, with a novice unload partway up. The single track meant that it took some time before the train returned to the base to load more skiers. Snowmaking and grooming ensured consistent conditions on the intermediate trails on either side of the track. 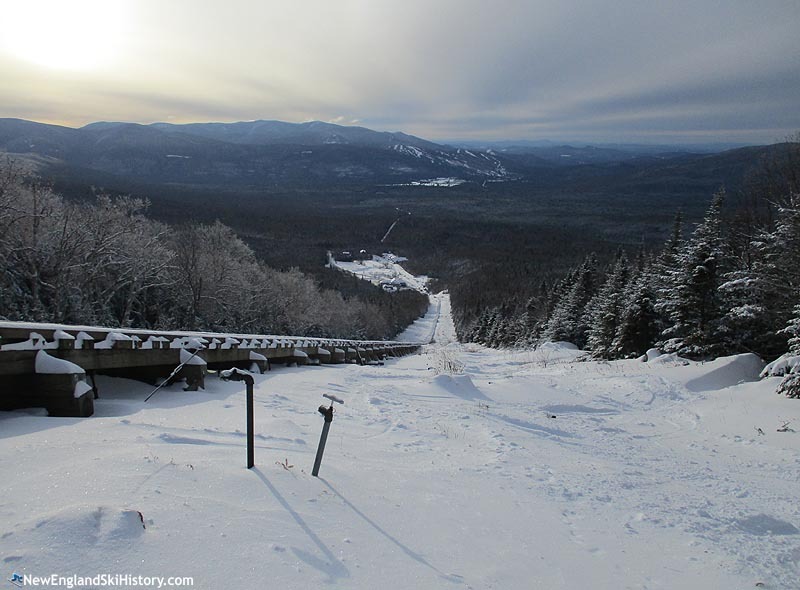 Package deals were available for Bretton Woods skiers. 2005-06 ended up being the second, and final, season of the Cog Railway Ski Trains. In June 2006, Bretton Woods was sold, effectively taking the Cog Railway out of the ski business. Winter cog operations were remarketed as the scenic Snowflake Express. As of 2018, backcountry skiers can pay a fee to park at the Cog base station and skin up and ski down the Cog Ski Path. Though snowmaking operations have been suspended, the pipe and hydrants remain as a relic of the former ski train facility.
" 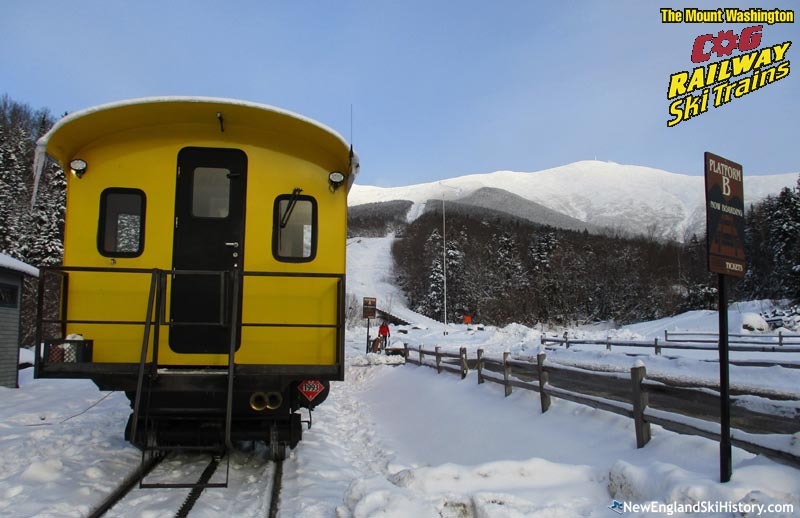 Bretton Woods hosted the the North American Ski Writers and offered one of the first ski train rides to the members. We put our skis in the outside rack on the side of the train car and when we passed by the water tank there wasn't enough clearance. Our skis and the rack made a lot of noise as they got crunched but no skis were harmed. The train had to stop and some of the skis wereremoved from the rack so we could continue. We had a fun time riding up and skiing down along the track. "